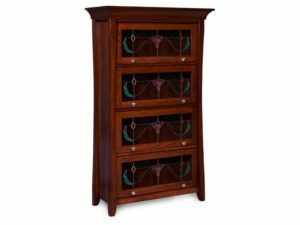 The design of barrister bookcases dates back to an era past when lawyers (barristers) needed to carry lawbooks on the circuit in a portable carrying case. 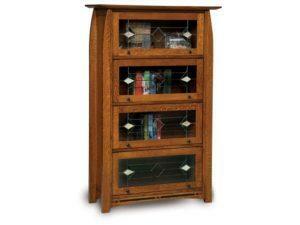 This self-contained, single-shelf bookcase often had a glazed glass door which swung open to the top. Also, barristers would stack these bookcases one on top of the other. The Barrister Bookcase was born. And today, you won’t find a law office without one. 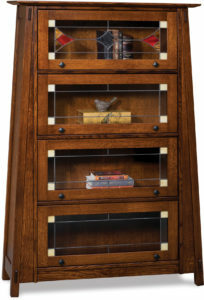 Looking for a barrister bookcase for your office, home office or non-legal living space? 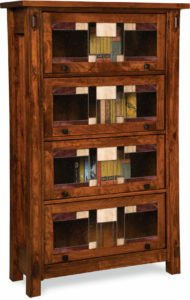 Browse the solid hardwood Barrister Bookcases collection below. And see which one fits your space the best. Or, visit our ‘brick and mortar’ store in Shipshewana, Indiana. A fine finish and glass doors accent the Barrister Bookcases. 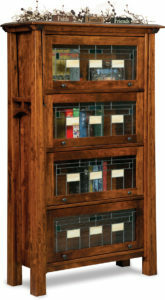 The Berkley Barrister Bookcase is accented with beautiful clear glass doors or leaded glass. 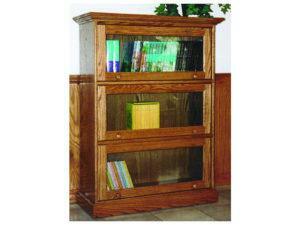 Skilled Amish craftsmen build each Barrister Bookcase with the traditional barrister bookcase features. They include roller glides to enable the doors to slide smoothly into the cabinet. Also, we create the shelves deep enough and high enough to accommodate your books, papers and journals — legal and otherwise. What’s more, our Amish builders use solid regional hardwoods like oak, cherry and maple. 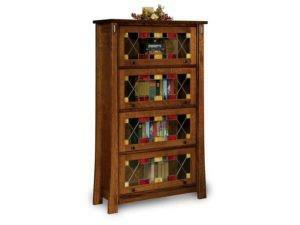 So this sturdy bookcase should grace your home for generations to come. You can order the bookcase as shown or unfinished. And we can customize it to fit your desires. For example, you can get an alternate leaded glass pattern.